Hubby's Aunty Rona has long been associated with knitting, yarn, and fibre arts in general. When she was much younger she worked for Patons in Melbourne, and long time President of the Knitter's Guild NSW in her area of Sydney (I may have some of these details wrong, going from my faulty memory - but you get the idea!). 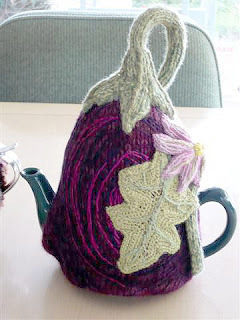 In recent years she has taken up freeform knitting & crochet - and these incredible tea cosies are some of her creations. She doesn't write patterns down, she just makes them up as she goes. So these are all unique! This eggplant cosy is my favourite - Rona actually grew eggplants in her garden so she could then sketch and paint them from life, and from this she created this cosy - it has a lot of embroidery on it, as well as knitting and crochet, and padding inside. 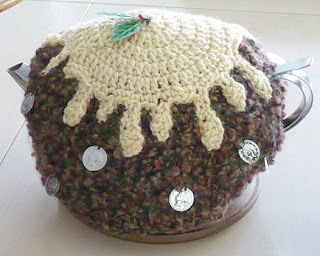 This Christmas Pudding tea cosy was inspired by a similar design in Killer Tea Cosies by A and D Wallis. There's another photo or two on this post from 2006. She is one talented lady! All cosies designed and made by Rona E Warner, fiber artist. Reproduced with permission. Photos by my mother-in-law Chris. aunty Rona is A Genius. my heart went out to cat number 2. I could not say it any better than m1ki. I too love cat #2. What talent and it runs in the family. I can't claim any genetic benefit, as she's my husband's aunt by marriage :) Yes, she is immensely talented! 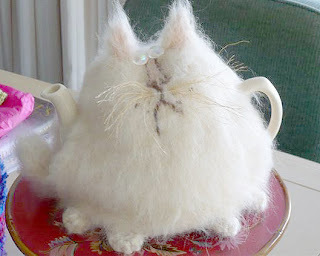 Oh my goodness those cat tea cozies look fantastic. 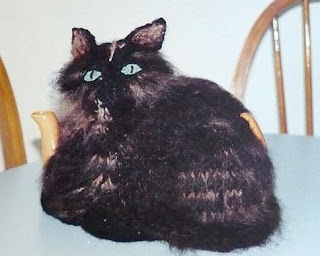 She is one talented knitter. I thought, for an instant, there was a real cat!! What a great talent!!! Cat #1 looks crazy! Just like us! 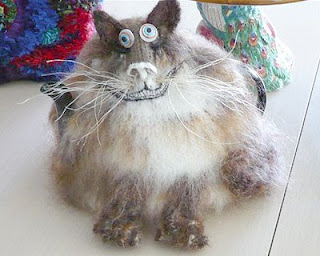 I love Cat 1 - is there any way to buy one of these fabulous creations? Those are stunning! LOVE the funny cats! The cat cozies totally, totally rock!! I am inspired. They are amazing. I am in awe of people who just pick up needles and knit! I need a (good, explicit) pattern. I love the way eggplants look. I love the color and the shiny-ness of them. The cozy is gorgeous. My son, who loves cats, is going to love these! OMGoodness - how on earth did I miss this post!